Join us for FLC’s Summer Celebration on Saturday, August 18, 2018! RiverView Family Farm sits on 265 acres and is located on Fort Loudon Lake in the Concord community of west Knoxville. The farm has the Tennessee Century Farm designation and has been in the family for 7 generations. This is a working farm providing grain and grass fed beef and hay. Every year, FLC’s Board of Directors, staff, Friends of the Foothills, Corporate Sponsors, and those interested in learning more about the organization get a chance to visit and hear about our project successes and highlights. And, we just enjoy spending time with each other – it’s a party! On behalf of FLC’s Board of Directors and staff we wanted to thank all of our Friends for joining us at FLC’s annual Summer Celebration! FLC’s program kicked off with a short presentation from FLC Executive Director, Bill Clabough. Bill highlighted that FLC has the potential, by the end of 2017, for another standout record year in regards to preserved acreage. Bill also recognized all of the landowners FLC has worked with over the years who were in attendance, as well as the organization’s Board Members, staff and volunteers. In addition, he spoke about FLC’s move and ownership of the Harris Farm in Rockford, TN. Doug Mills, Videographer of the local television program, “The Heartland Series”, provided his outstanding photography skills to capture the Celebration attendees. Click here to view event photos. Holly Hambright’s crew and the Pour Guys took care of guests with a Southern menu that included: Holly’s Famous Candied Bacon, Marblegate Farm Caprese Salad, Pork & Chicken Sliders, along with assorted desserts, including Thumbprint cookies from Magpies. Door prizes included a rain barrel donated by the Water Quality Forum, a year subscription to the Tennessee Conservationist Magazine, a gift basket filled with Tennessee products, a hand made bluebird box out of NC and several other items. 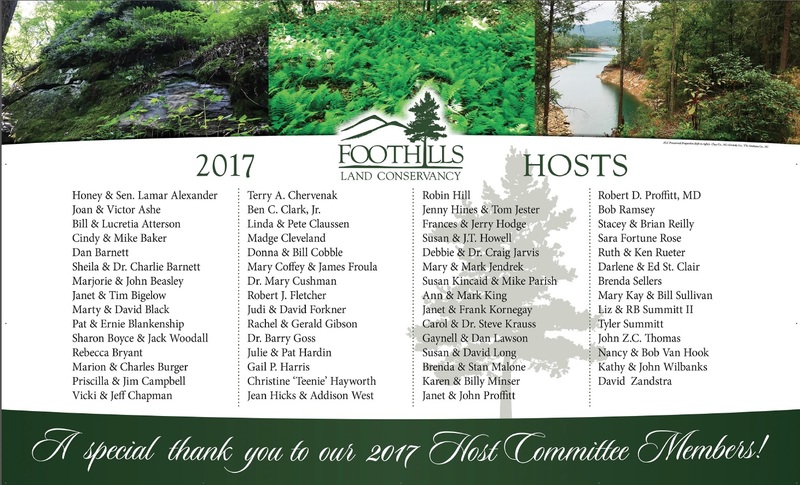 If you have any interest in supporting next year’s Celebration, becoming a 2018 Celebration Sponsor or an individual Host Committee member, please contact Elise Eustace at eeustace@foothillsland.org or 865-681-8326. 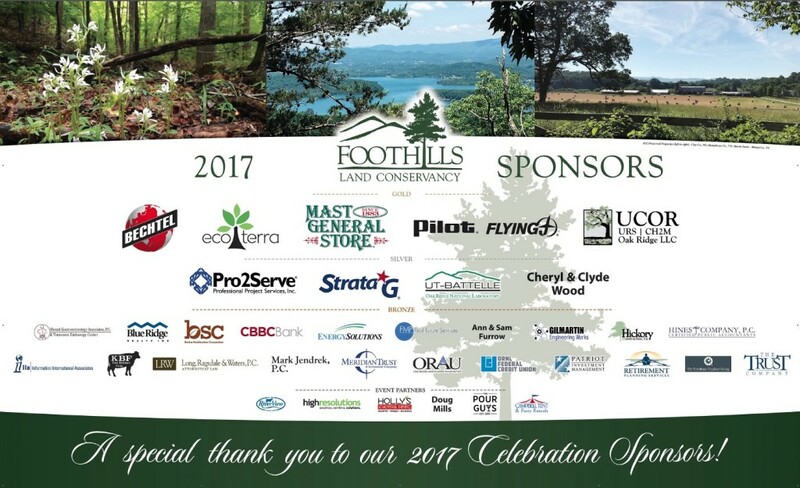 A special thank you to FLC’s 2017 Sponsors and Hosts!